A new auto mode on the Mavic 2 Zoom, called Super Resolution, uses the drone’s optical zoom to shoot nine individual images of a scene and then automatically stitch them together into a 48-megapixel photo. The drone’s zooming capabilities have led to new video modes too. Dolly Zoom QuickShot allows videographers to quickly replicate cinematic techniques popularized by folks like Hitchcock, where the camera zooms in on a subject while moving backwards.The bodies of the two new models are identical, and are slightly larger than the original Mavic Pro; like the orginal, they also fold down for easy transport. Both are equipped with omnidirectional sensors that can track the drone’s movements left, right, up, down, forward and backward, utilize a 3-axis mechanical stabilization and feature new auxiliary lights on the bottom to help with landing and flying in low-light situations (like dusk and dawn). 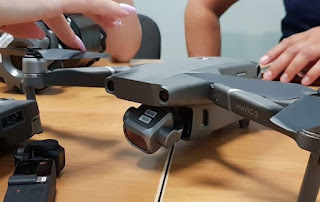 A redesigned winglet and new motors make the two drones quieter than earlier models.Let’s start with the Mavic 2 Pro. Marrying Hasselblad’s top-notch camera design with DJI’s drones has seemed inevitable since the Chinese drone maker bought a majority stake in the storied imaging company in 2017. While tech companies often cut deals to put the names of camera brands on their products, it doesn’t always mean there’s an appreciable bump in image quality. DJI’s close ties with Hasselblad mean there’s probably more to this integration than just a sticker on the side of the drone. Buying the Mavic 2 Pro over the Zoom is about making a choice on quality. It has a 1-inch, 20-megapixel CMOS sensor — the same size found in the company’s more expensive Phantom 4 Pro drone — and a bright, variable f2.8-f11 aperture. There are pro color profiles for video, like 10-bit Dlog-M, which will make it easier for editors to manipulate the footage to their liking after shooting. It also supports 4K 10-bit HDR. The Zoom is more about versatility. It uses a smaller 1/2.3-inch sensor, but it has the ability to zoom from a wide 24mm view to a slightly more telephoto 48mm perspective on the fly. It shoots smaller 12-megapixel photos, though there’s a “Super Resolution” mode where the drone will take nine photos and stitch them into a larger 48-megapixel image. And there’s a “dolly zoom” mode that can mimic the popular technique used by cinematographers. Both drones have new shooting modes that capture hyperlapses (sped-up time-lapse videos that come straight out of the camera) in different ways. DJI also says it has improved its subject tracking and obstacle avoidance software, meaning it should be easier than ever to set the Mavic on a particular path and let it do some of the work for you. When DJI debuted the Mavic Air at the beginning of this year, a question many people asked was: what does this mean for the Mavic Pro? The original Mavic Pro was something of a revolution at the time for its mix of pro-style features and portability. The head of DJI’s North American operations even pulled the drone out of his back pocket onstage to emphasize its compact size. But the Mavic Air did all this and then some, adding things like more advanced obstacle avoidance in an even smaller body. The Mavic 2 shows the genius of DJI’s product lineup strategy. By filling out the lower end with 2017’s Spark drone and placing the Mavic Air in the middle, the company gave itself room to improve on the original Mavic Pro. The result is a drone (or two drones) that resemble the company’s best prosumer option — the Phantom series — in a form factor that’s still more portable than basically anything else on the market. It’s also resulted in a far higher price tag than the $749 and $999 options of the original Mavic. But with cheaper options below, there’s less pressure to shell out all that money.Both models can record at a maximum bitrate of 100 Mbps using H.265 compression, include 8GB of internal storage, and can capture 4K video at up to 30fps as well as HD video up to 120fps. Each has a respectable flight time of 31 minutes.